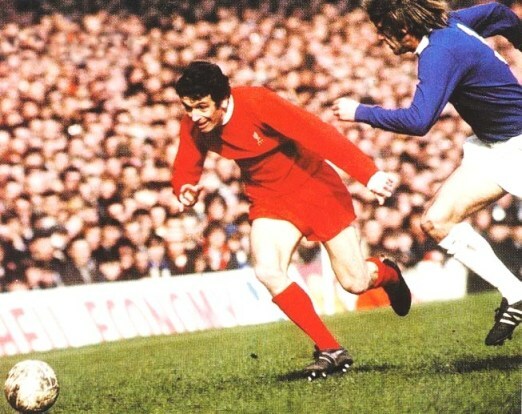 Ian Callaghan - The Marathon man - LFChistory - Stats galore for Liverpool FC! Ian Callaghan is literally synonymous with Liverpool's history. He was a part of the successful teams of the 60's and the 70's and played for both Bill Shankly and Bob Paisley. His greatest claim to fame as it were is of course being the player that has played most games for Liverpool in the club's glorious history, an incredible total of 857 games. So did Mr. Liverpool himself, Ian Callaghan, start out as a Red? I wasn't anything really. It wasn't until I went to watch Liverpool play that I became a Red. Some weeks later I went to Goodison. Everton was the in first division, a bigger and a better ground, but it wasn't the same atmosphere and I became a Red. My dad was a blue. He didn't usually go to the games, but deep down he was an Evertonian. I went to very few games at the time because I used to play twice at a Saturday, for my school in the morning and played for the boy's club in the afternoon. I stood on the Kop. When I started to go I was about 15 and playing for Liverpool. Before I left school I went into the Boy's pen which used to be in the Kop and which is an experience. They didn't take lads on then until they were 15 and leaving school. I just signed as an amateur. I used to train two nights a week, on a Tuesday night and a Wednesday night at the training ground, Melwood. Then I signed professional, gave my job up and went full-time. Was your dad happy with you being a Red? He was when I played for the first team. He changed his colours when I started to play for Liverpool. You quite embody the history of Liverpool from the start of the Shankly era. That's right. I signed professional in 1960 and Bill Shankly had just come in '59 and he watched me play with the junior teams and then put me in the reserves. Shanks came down to where I lived when he wanted me to sign professional and met me mum and dad. I was from a background which is very ordinary. I think he took it upon himself to look after me. Shanks, if he walked out of his office and you were messing around in the corridors you would stop straight away. I loved the man and never had a cross word with him. I never went in for a rise. You made one of the most memorable debuts in Liverpool's history on 16th of April 1960. Everything I did was right. When I hit a bad ball it went to a Liverpool shirt. They actually clapped me off the field, the referee and the players. It was quite an unbelievable occasion. I went on the bus when I made by debut. It wasn't many cars in them days. People didn't have cars. I thought I was giving me plenty of time but when I got to the bus-stop, they were queuing at the bus-stop to go the match. They all knew who I was as it was in my neighbourhood. Several of them said: 'Let Cally get on the bus, he's playing.' I went at the front of the bus and got on the bus. I got off at the ground, played and got the bus home. The supporters were talking about the game on the bus going home. I had made such a fantastic debut and they give me a pat on the back. Did they clap you off the bus as well? Callaghan played four games at the end of the 1959-60 season and then hardly had a look in the following season, playing only 5 games. Shankly signed Kevin Lewis from Sheffield United who scored 22 goals in 36 games in the 1960-61 season, which kept Callaghan out of the Liverpool side. 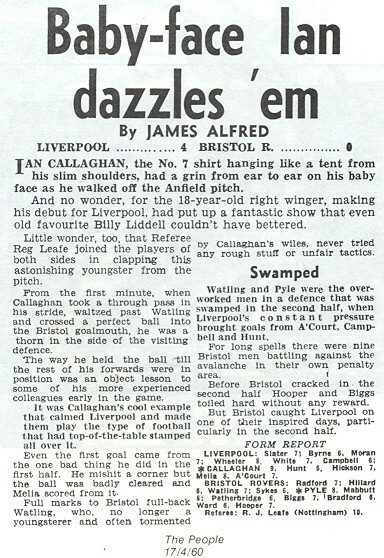 A brilliant goal-rate by any means by Lewis, so was there much chance for Callaghan having a look in the 1961-62 season, when Liverpool got promoted from the 2nd division? Kevin Lewis played about half of the season and then I played the second half of the season. I got a medal for the win in the second division. You had to play twenty something games before you got a medal. That season I was in the reserve team as well. Lewis scored 10 goals in 21 games in the 1961-1962 promotion season and then 12 in 26 games when Liverpool was in the 1st. He had scored 44 goals in 82 games, not bad by any means? I don't know what happened, but I know he then went to South Africa. Very curious as he was a terrific goalscorer. I got into the team. I was never a goalscorer. Shanks must have thought I had something and I got into the team when we won the second division. I was a fixture then. Describe yourself as a player..
At school I was what they used to call a wing-half. You call them midfielders these days. When I signed for Liverpool I was so small that they decided to put me on the right wing. I just took to it really, because I was quite quick. I used to take the full-back on and get to the byline. That was my strength. I showed Callaghan the picture above: "This is a good picture. That's it. Going past him and getting to the byline."